I don’t often write reviews. Choice of equipment is very personal: experiences of the same component or item of clothing are subjectively variable and I have bought many disappointing items that others love. That doesn’t mean they were wrong, just that I don’t see the world their way. 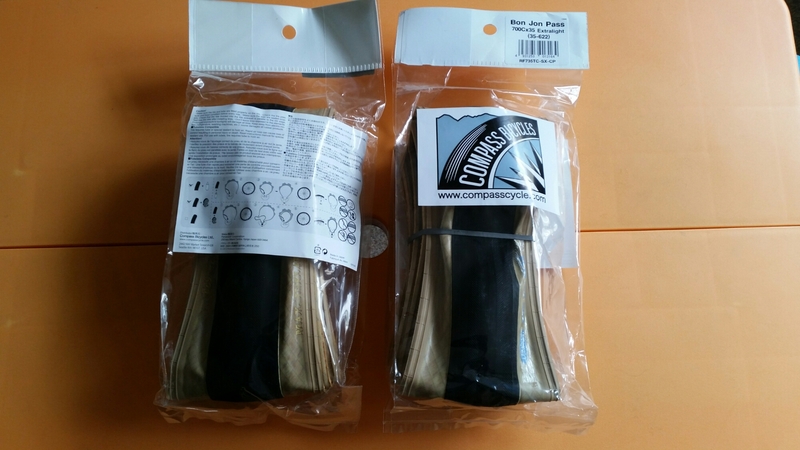 I will however tell you what I think about Compass tyres (tires in US), or more precisely their 700 × 35c Extralight clincher, the Bon Jon Pass. Compass tyres are widely promoted in the randonneuring world having been developed by Jan Heine with Panaracer in Japan. They are reputed to be light and supple, are good at low pressures and come in a wide range of sizes (up to 38 mm for 700c; wider for 650b and 26″). They are indeed objectively light and supple, and are available in a very pale skinwall version, or all black. I chose the Extralight version as I am a puny lightweight and thought I could get away with it. 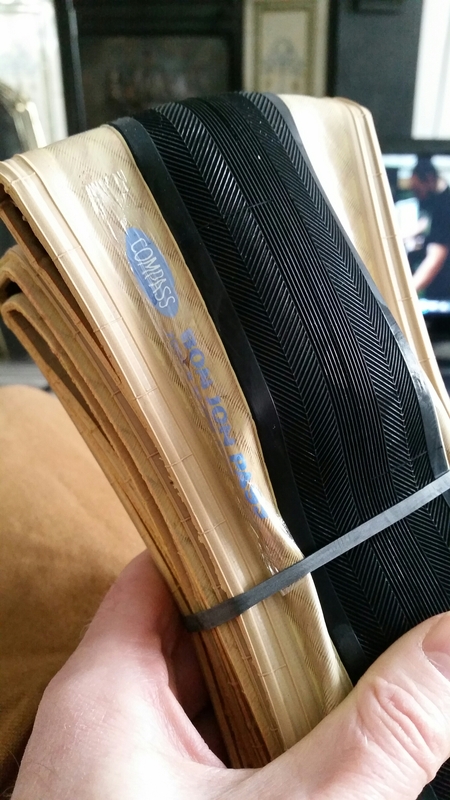 The Bon Jon runs tubeless, but I’m running them with standard butyl tubes because I am a late adopter. They fitted quite tight on the stock rims on my Whyte Suffolk (made by Alex I think) and took a while to seat properly – I inflated to about 80 psi to make sure they were seated and have settled on 40 front and about 50 rear (I weigh 58 kg): I could probably go lower but I think I will wait until I go tubeless sometime in 2020. 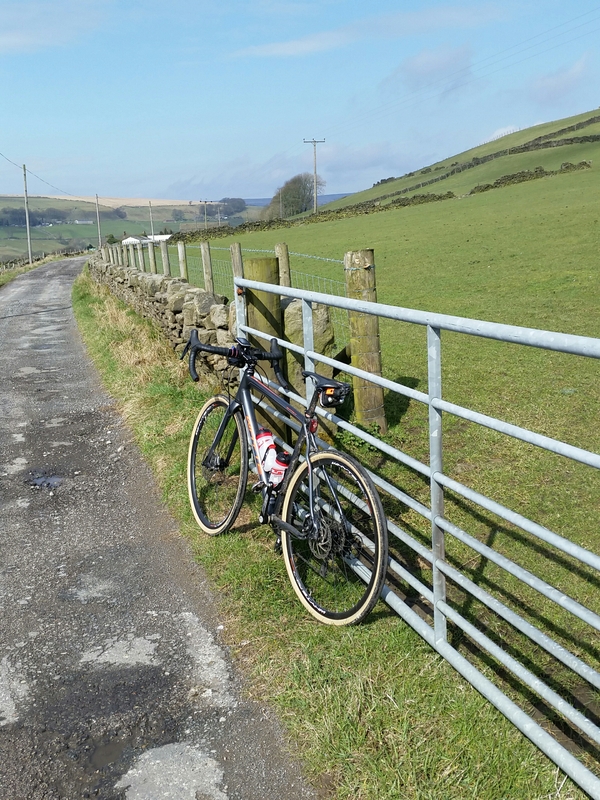 My first ride was at 60 and 55 which seemed a little high: at the lower pressure I can descend very quickly and confidently although if I climb out of the saddle the front tyre looks absurdly squishy. So, apart from excellent descending in all weather, how do they ride? The only time I have regretted being on them in their first 750 km or so was lost on a farm track where the road turned to mud and was upward. Tarmac, cobbles, gravel (big and small) all seem fine. Even a bit of mud is OK if one is not trying to climb or get started! 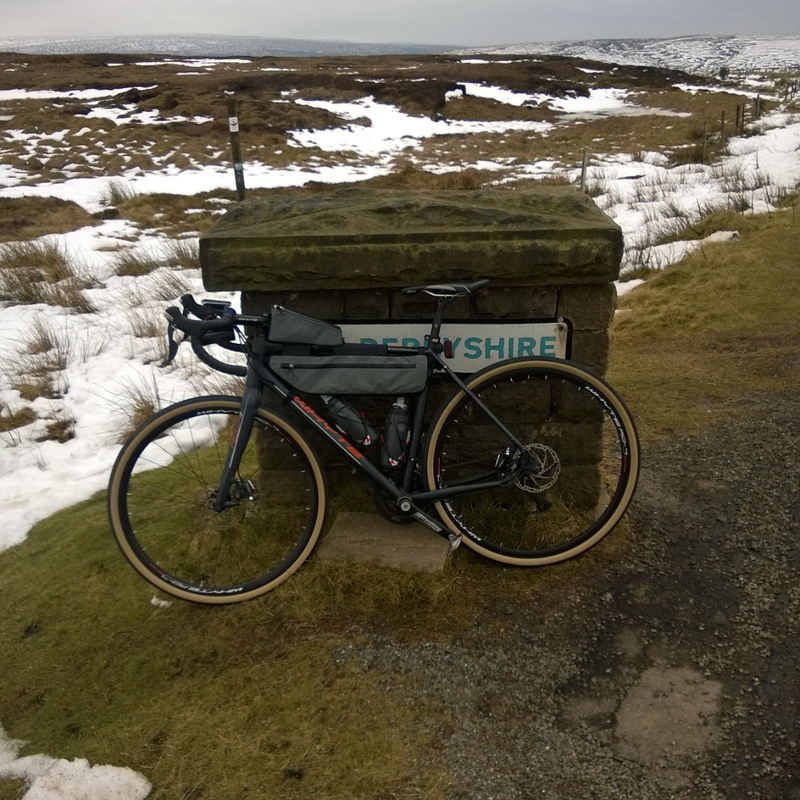 I have done two long rides on very mixed terrain and they were comfortable and felt very safe (and I am awful off road). The lack of side-knobs or raised tread would only bother me in really muddy conditions. On the road they are luxurious and I don’t think they slow me down. The main reason I chose the 35c version was frame clearances. They fit my frame with just enough room (the chain stay clearances are unnecessarily tight) for safety, and I can just fit mudguards to keep ride companions happy. No punctures yet and I have removed one sharp flint from the tread; the flimsy sidewalls still seem fine after some rocky path encounters. 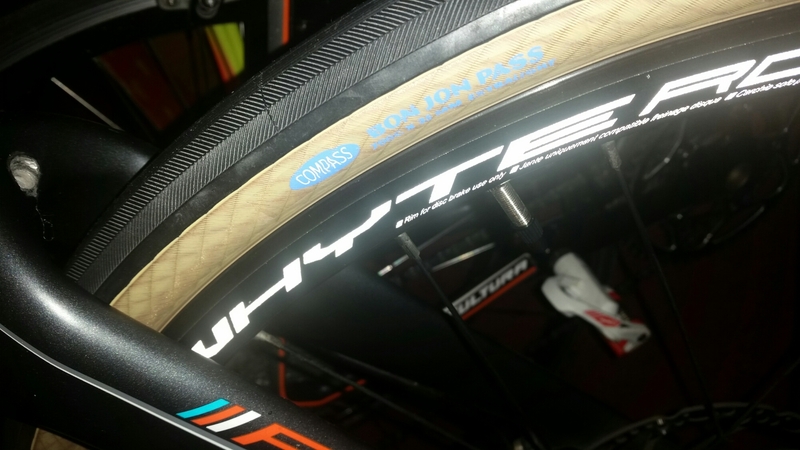 For mixed riding and/or long distances they are quite the best tyres I have ridden. I intend to use them on my next 300 with George and Gavin in May and I’ll report back after that, but after 105 km of awful cycle path, track and chipseal roads yesterday which delivered great comfort I am not expecting to be disappointed. You can buy Compass tyres direct from Compass themselves (see Jan’s original blog post about the newer tyres here) or if you are in the UK you can get them Extraquick and Extralight from Velo Vitality in Brighton. They aren’t cheap, but good tyres never are… in my opinion! 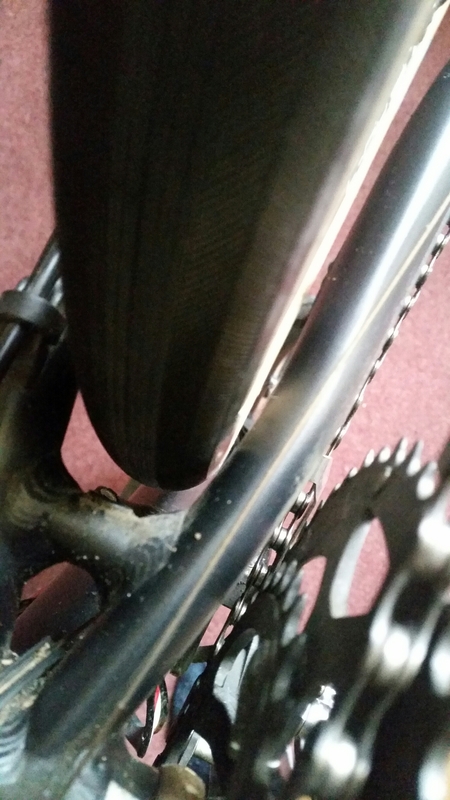 NB I paid for these tyres myself and have no connection with Compass or Velo Vitality other than as a happy customer. This entry was posted in audax, cycling, equipment, randonnée, randonneur by spandelles. Bookmark the permalink. Very useful review as I’m looking at my next set of tyres for my tourer. It mainly gets used for commuting but weekend and evening rides sometime take it off the tarmac and into the woods. Out of interest what tyres where you using previously? 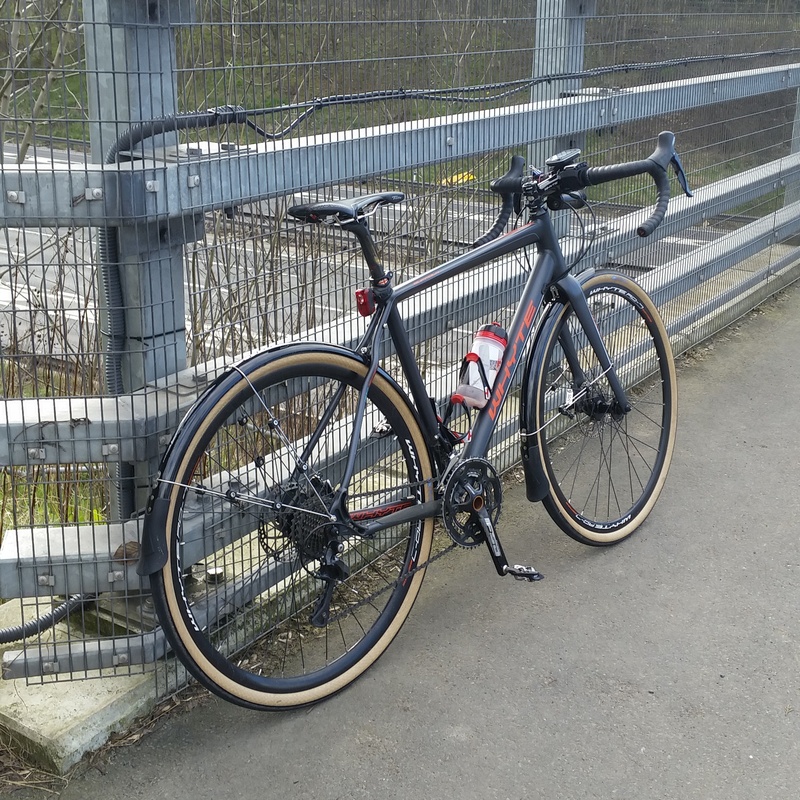 Hi Tim – I’ve used all sorts – on that bike I’ve used Schwalbe Ultremos in 28, Vittoria Paris Roubaix in a 27, also Tufo 25 section tubular clinchers, Michelin Muds and Pasela 35c. The latter are the closest to the Compass in size but although good are completely different at the same pressures as they are stiffer. I still haven’t had a puncture yet and the sidewalls are fine so far, so although some of those tyres are nice I can run the same pressures as I did with the Michelins or Panaracer Paselas, with the speed of the Tufos or the Vittorias. I wouldn’t dare ride the Tufos off road and the Vittorias are also a little narrow. So it’s a win for Compass so far (now accentuated by some lighter wheels, the stock wheels on my Whyte are overkill). Thanks for the details. Your review gives me the impression I might be floating on air if I switch to them from my heavy and stiff 700 x 28 Marathon Pluses. I’m now tempted to give a set of 700 x 38 a go. Wow these mudguards look Realy nice. Wehre can I get one of those? Bontrager – their pretty easy to source online and in many shops too.